Past, Imaginary, and Future: Arrrr! 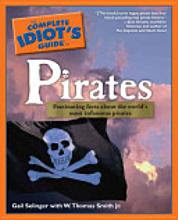 The Complete Idiot's Guide to Pirates! Arrr, mateys! I hope ye be enjoyin' Talk Like a Pirate Day! I figured it be a fine day t' review a piratical book I acquired in me travels. The Complete Idiot's Guide to Pirates, by Gail Selinger with W. Thomas Smith Jr. be startin' out with the whole history o' sailing an' pirates, though at least one reviewer were complain' about a lack of historical accuracy. I can't much speak much to that, as I be writin' fantasy pirates, not real ones. I can tell ye the first few chapters were a mite boring, 'til they got to talkin' about real pirates. And not all of them were so interesting either. The book be laid out in chapters, with big headings an' smaller headings throughout, an' outlines o' what the chapters be coverin' at the start an' recaps o' what they covered at the end. It still be surprisingly hard t' find some of the information when ye need it, though the index be all right. I thought things picked up around Part 2, an' particularly around Chapter 7, when they be startin' to outline life on a ship an' talkin' about press gangin' sailors. Apparently glass-bottom tankards were t' help keep people from bein' forced into service! I ain't so sure about th' Cat o' Nine Tails bein' the origin for lettin' the cat out o' the bag. Part 3, more about specific pirates, be havin' some points o' interest too. Later on, the parts about the Barbary Corsairs and the Christians and Muslims fightin' had such acts o' cruelty they be makin' a pirate blush. I ain't sure if they were relevant to a lad or lass with an interest in piratin' or not. Overall the book helped me t' understand Pirates of the Caribbean: On Stranger Tides much more, with the bits on press-ganging, the mutual hatred between the Spanish an' English, the storin' of weapons away from the sailors to prevent mutiny, an' of course the difference between a pirate an' a privateer. Made me wonder if the writers o' the script read this book. I can be speakin' for a few bits o' historical matters which may or may not be right. They be tellin' a heartbreakin' story about Captain William Kidd bein' forced back into piracy, but a quick search o' the Internet and I couldn't find nothin' about him bein' forced to go back t' sea against his will, just that it ain't clear why he did. Their account may true, may not. Their tale about Captain Bartholomew Roberts don't sound in the least like this biography I recently acquired using me special offers enabled magic readin' device, though I admit I haven't read it yet to be sure. Again, I ain't sayin' the book ain't right, but it don't seem to match with what I be seein' elsewhere. But the one that be worryin' me the most is near the end when they be talkin' about Chinese woman pirate Lai Choi San, a.k.a. Lai Sho Sz'en. They spin a fine yarn about her, then say that "no reputable pirate historian has been able to verify (reporter) Lilius's claims" an' that "with no 'hard' evidence Lao's story needs to be classified as fiction." The fiction bit be disappointin' enough. But I don't understand why they be callin' Ms. Lai "Lao" by the end o' the section. An' then at the end o' the chapter they reiterate "Lai Choi Shan emerged in the 1920s and continued her family's traditions of piracy." That be the fourth way o' spellin' her name by me count. I know Chinese names be hard t' spell in English, but didn't they just say they be relatin' a fictional tale about her, on account o' the fact they didn't have any hard facts? I be more than a touch concerned that they be sayin' the tale was real after all, and that they don't know how to be spellin' her name. The glossary be o' limited value to landlubbers, as it don't be definin' port, starboard, bow, or stern! Anyway, true or not, the book be worth a look, particularly the middle sections. I be trustin' the bits about nautical life pretty well. 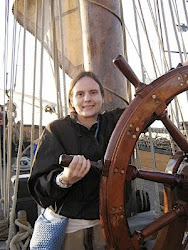 The book credits say Ms. Selinger be a gunner on tall ships in her spare time, so could be she knows a bit about the sea. But as far as the history be concerned, I'd be double-checkin' the "facts" if you be lookin' at this for any serious purposes. Fairly warned be ye, says I.